What inspired your new book? Since I first started embroidering, I've come across many different embroidery techniques that captured my interest and I wanted to try them out. I've never seen one book that served as a basic introduction to different types of embroidery beyond basic stitches, so that's what I set out to do with this book. 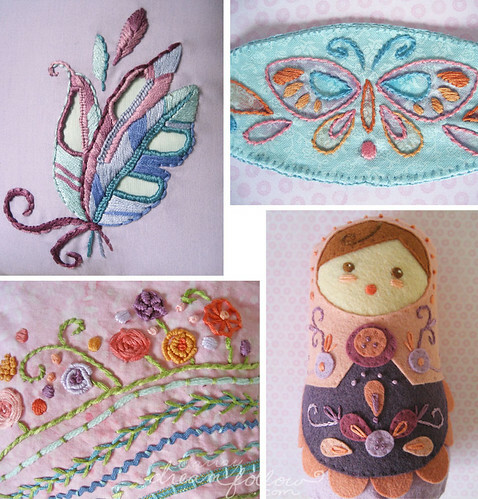 This book has a lot of different types of embroidery - did you learn something new while working on the book? I learned a lot! It was my first time experimenting with a lot of the techniques. I basically self-taught myself Cutwork, Stumpwork and Shisha stitches from many different sources and then simplified them to create my own designs and projects for the book. It was so much fun to research and dabble with new ideas and I know these new stitches will continue to find their way into my own projects. 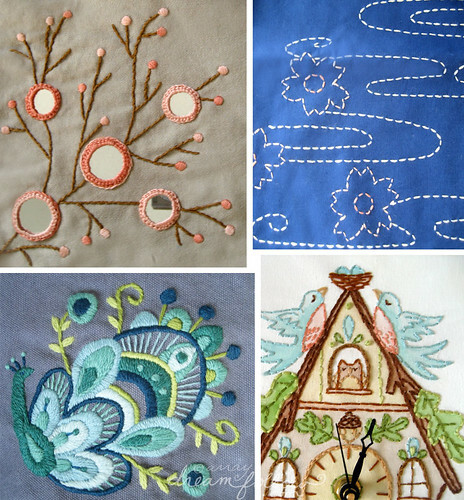 What's your favourite type of embroidery from the book? I found myself really enjoying the Crewel projects. They are very time consuming and there are no shortcuts to creating a large Crewel piece. I'm normally a pretty fast paced person so it was nice to slow down and dive deeply into them and take my time to make them right. Do you have a favourite project in the book? What inspired it? We have one copy of the book to give away. - you can not get extra entries by tweeting, liking on Facebook etc etc. One person, one entry. 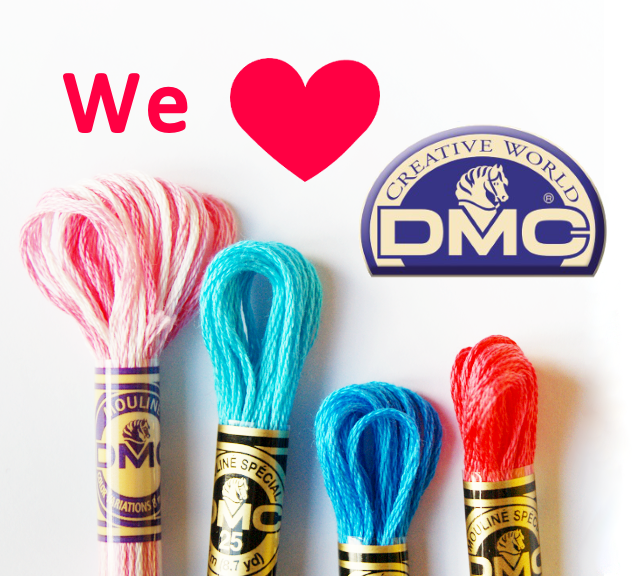 - we'd love to hear about what kind of embroidery you'd like to try, but that is optional! Entries by 'Anonymous' can not be accepted, we must have atleast your first name - and a way to contact you as mentioned above. The giveaway is open to anyone, anywhere. The giveaway closes on Tuesday, March 5th at 8pm UK time. The giveaway is now closed, thank you for entering! Aimee's book looks great! I've never tried cutwork so it would be a wonderful opportunity to try it. Thank you for the chance of winning. Thank you for this opportunity to win it! I'm new in embroidery, but I'm experimenting new stitches and tecniques everyday. I like everything can give a modern touch to this art! I'd love to try crewelwork and stumpwork but I always felt I needed someone to teach me!! Aimee shows us this is not the case! This looks a lovely book. I am keen to try some embroidery - so far I have only used running stitch to embroider words on to quilts, but would love to branch out! That little clock is so cute and just the thing I need for my kitchen. Amy's new book looks like it's got lots of fun projects. I've done lots of embroidery and would like to give crewel a try. The interview was great and thanks for a chance to win the book! I'd love to try blackwork. There aren't that many good guides out there for explaining exactly how to do it. I love Aimee Ray, she makes the cutest things. I would love to try crewel work one day. This book is on my wish list. I would be great to win it and therefore save some money for new floss. Yarn and Floss on Flickr. I like Aimee's books very much and this new one is already on my wish list. I would like to try stumpwork. I would love to learn shisha and get into crewel a bit more. Brodwaith on flickr. Crossing my fingers! I would love to learn shisha! And this book is also great just for project ideas - love the idea of the family tree! This book looks fantastic. I learned crewel first, when I was a little girl, and then abandoned it for cross-stitch and other needlework techniques. Now I'd love to get back into it, and learn some new stuff! Great giveaway, thanks for the chance to win this book. I'd really love to try crewel work. :) Thanks so much for the giveaway! Amazon wish list. I love Aimees Matroishka Doll. Thank you for the chance. Aimee's projects look lovely. Embroidery is a friend to me and takes me to a quiet space of thought. I would love to try everything in the book! That book seems beyond lovely! Aimee's patterns are wonderful! I'd love to own this book :). Thanks! 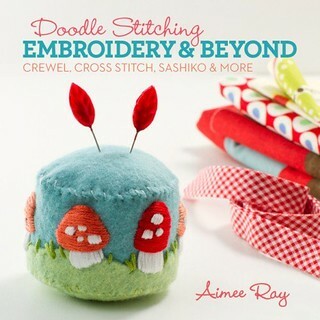 I'd love to learn some new embroidery techniques, and if this book is as fun as the original Doodle Stitching, I know I'd love to own it! Oh how neat! I've recently been getting into needleworks of all type but know very little about anything other than cross-stitch, so I would love the chance to get to explore this book! Crewelwork look so lovely - would love to try it sometime. This book looks great! I am looking forward to trying crewel embroidery. It's been on my to try list for some time. Thanks so much for the chance to win, Aimee is one of my faves! I'd love to win this book! I'm dying to make the little mushroom pincushion on the cover. I recently branched out from cross stitch to other kinds of embroidery--learning new stitches is always great fun! I'd like to try mixing paint in with embroidery, like in the clock above. I've never read one of the Doodle Stitching books, but have heard a lot of good things about them! I'm relatively new to embroidery, and I'm always interested in new techniques :) My e-mail is on my Blogger profile, and I am also on Flickr! the book looks beautiful, thank you for hosting a giveaway. I was so inspired by the shisha pieces I recently saw when traveling in India, it would be great to learn this technique. Lovely book. Keep meaning to try sashiko and would have lots of fun with this book. I would love to Doodle in stitching,meaby then I can use it in my mixed media art! I've never quite got around to proper crewel work, looks good. thanks for the opportunity. I love embroidery and you are realy inspired, great job! Awesome looking book as usual. I love to embroider on felt. Thanks! Oh what a lovely book, the crewel work is beautiful, I could not imagine doing anything so good! I would love to learn more stumpwork. Thanks for chance of winning. Hiya, I've just found your blog and going to make a cup of tea and spend some time catching up. From a quick glance I think it's going to be an enjoyable morning's reading. I like to embroider too, especially when I need a mental distraction from worklife stresses and so would love to win this fabulous book. Thank you for the chance. O, I would really like to win that book! Thanks for an inspiring blog. I've taught myslef how to embroider with Aimee's first book, so naturally I'd love to give her new one a try as well. Being an illustrator who likes to work with mixed media, I often embroider paper. It's a fun way to combine drawing and stitching. In the future I want to try more techniques, especially crewel embroidery. would love to try my hand at crewel again! I am new to embroidery and would love to learn any and all techniques but especially doodling with embroidery!